Learning to crochet is not difficult but, like anything else, it can take some practice to get it right. Before you get started, you will need some yarn and a crochet hook on hand. SInce you are going to be working on learning the basic stitches, the size of the hook doesn't matter much. Choose one that feel comfortable in your hand. When you do a project, you will want to use the size specified. Beginning crocheters need only a few materials to get started. You can find everything you need at your local craft store. Crochet hooks range in size from a tiny 14 to an 00 in metal hooks and from a B to a Q in aluminum hooks. The metal hooks are used for making lace and working with crochet cotton, a thread-like fiber. You will want an aluminum hook in an F, G, or H to get started. This is big enough to hold easily without being so big that it is hard ot maneuver. Use a three-ply yarn. Choose something inexpensive because this is just for practice. Get a color that the crochet hook will stand out against; don't get a red hook and red yarn, for example. It is important that you are able to see what you are doing. You'll need a pair of sharp scissors to cut the yarn. You may already have these on hand. There are a few basic crochet stitches that it is important to know. Once you learn how to make these, you'll be able to create lots of fun projects. Cross one part of the yarn over another to make a loop, leaving at least four or five inches of yarn on each side of the loop. Bring the yarn down behind the loop. Pull the yarn from the skein through the loop and pull. You've made a new loop. Use your left hand to hold the end of the yarn, and loop it over your ring finger and under your middle finger, then over your index finger. Hold the hook in your right hand. Insert the crochet hook through the new loop. Make the stitch tighter by holding the both strands of yarn between your thumb and forefinger and pulling the loop tight. With your index finger, loop the yarn over the hook. This is a yarn over and is abbreviated as "yo." Pull the yarn through the loop with the hook, and draw it tight but not too tight. You want to be able to insert the crochet hook in it for other types of stitches. You have made a chain. Continuing making chains until you can make them all evenly sized and not too tight. Create a foundation chain of at least 20 stitches. Be sure that you have the right side of the foundation chain facing you and your left hand holding the foundation chain. Draw the yarn over your hook with your index finger. With the yarn still over the hook, push the hook through the stitch. The hook now has two loops on it. Use your index finger to pull yarn over the hook again (yo). Pull this third loop through both loops on your hook. You've just made one single crochet. Repeat until you are comfortable with the stitch. Draw the yarn over the hook again. Insert the hook into a chain stitch. There are three loops on the hook. Yarn over (yo) and draw the loop through one loop. Yanr over (yo) and draw the loop through the remaining loops on the hook. You've just made one double crochet. Repeat until you are comfortable with the stitch. Make a foundatin chain 20 stitches long. 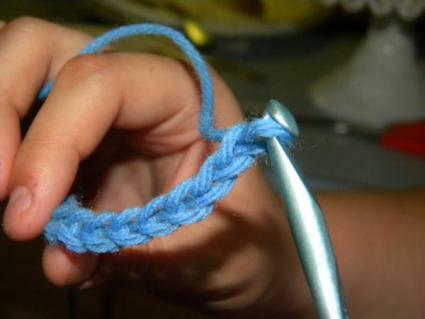 When you are finished, end off by making a chain stitch. Cut the yarn six inches from the chain stitch and pull the end through the chain stich with the hook. Pull tight. Weave the end of the yarn into the single crochet. With these easy stitches, you can make a scarf, which is an excellent first project. Just make a chain as wide as you want your scarf, and then make single or double crochets until it is as long as you want it to be. When you have the right size, just finish it off. Crochet is a rewarding hobby that, with some practice, will allow you to make many clothing and home decor items.